Conditioned that ploughing is the sure way to produce crops, Zimbabwean farmer Handrixious Zvomarima surprised himself by trying a different method. He planted cowpea seeds directly without tilling the land. It worked. Fostering and harnessing innovative technologies could significantly reduce the negative impacts from climate change, including drought, water scarcity and food insecurity in African countries. A Trinidadian scientist has developed a mechanism for determining the degree of climate-smart agriculture (CSA) compliance with respect to projects, processes and products. Climate-smart agriculture seeks to achieve food security and broader development goals under a changing climate and increasing food demand. The Caribbean accounts for seven of the world’s top 36 water-stressed countries and Barbados is in the top ten. The Food and Agriculture Organisation (FAO) defines countries like Barbados, Antigua and Barbuda, and St. Kitts and Nevis as water-scarce with less than 1000 m3 freshwater resources per capita. Implementing climate-smart agriculture is critical to reduce hunger and poverty, according to International Fund for Agricultural Development’s (IFAD) new president Gilbert Houngbo. As Caribbean Community (CARICOM) countries continue to build on the momentum of the 2015 Paris Climate Agreement and the 22nd Conference of the Parties (COP22) of the United Nations Framework Convention on Climate Change (UNFCCC) in Marrakech in 2016, special emphasis is being placed on agriculture as outlined in their Intended Nationally Determined Contributions (INDCs). Mirantsoa Faniry Rakotomalala is different from most farmers in the Greater South of Madagascar, who are devastated after losing an estimated 80 percent of their crops during the recent May/June harvesting season to the ongoing drought here, said to be the most severe in 35 years. After over a year of extreme weather changes across the world, causing destruction to homes and lives, 2015-16 El Niño has now come to an end. Merian Kalala, a farmer in Solwezi, capital of the North-Western Province of Zambia, knows firsthand that climate change is posing massive problems for agricultural productivity. With El Nino affecting countries in southern Africa, threatening agricultural production due to a massive heat wave, the World Food Programme has urged the international community to support the upscaling of climate smart agricultural technology for resilience. We are lucky to live in a country that has long since abandoned the image of the damsel in distress. Even Disney princesses now save themselves and send unsuitable “saviours” packing. But despite the great strides being made in gender equality, we are still failing rural women, particularly women farmers. 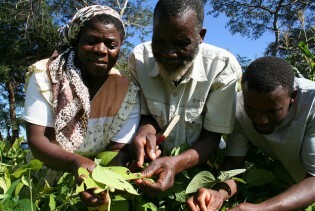 Climate smart agriculture practiced by some farmers in Malawi has improved harvests. However, the organizations supporting the practice among smallholder farmers who have witnessed reduced harvests due to climate change are not working together, and there is no uniform policy. This has compromised what could otherwise improve food security. Pilirani Tambala reports from Lilongwe. By leveraging knowledge about climate change, through adopting improved agriculture technologies and using water and energy more effectively, Africa can accelerate its march towards sustainable development. Small farmers can look to options like agroecological intensification and innovation, without necessarily turning to climate-smart agriculture, which is promoted by the United Nations but has awakened doubts among global experts meeting in this Italian city. On the sidelines of the U.N.'s heavily hyped Climate Summit, the newly-launched Global Alliance for Climate-Smart Agriculture announced plans to protect some 500 million farmers worldwide from climate change and "help achieve sustainable and equitable increases in agricultural productivity and incomes." U.N. Pushes Climate-Smart Agriculture – But Are the Farmers Willing to Change? United Nations Secretary-General Ban Ki-moon is expected to make a strong pitch to world political leaders at the U.N. Climate Summit in New York on Sep. 23 to accept new emissions targets and their timelines.